What do you give the people who usually don't need a thing, claim to not want a thing and tend to love your children more than anything on Earth?! Honestly, gifting grandparents can be tricky - we always want to find something special and personal to show them just how much they mean to us and it can take me weeks of researching to come up with something new and fresh. This year, I think I've found some really unique gifts, perfect for Grandparents, covering a span of price points and styles. Be sure to read through to post because many items have his and her options and ideas on how to personalize that really take the gift to the next level! 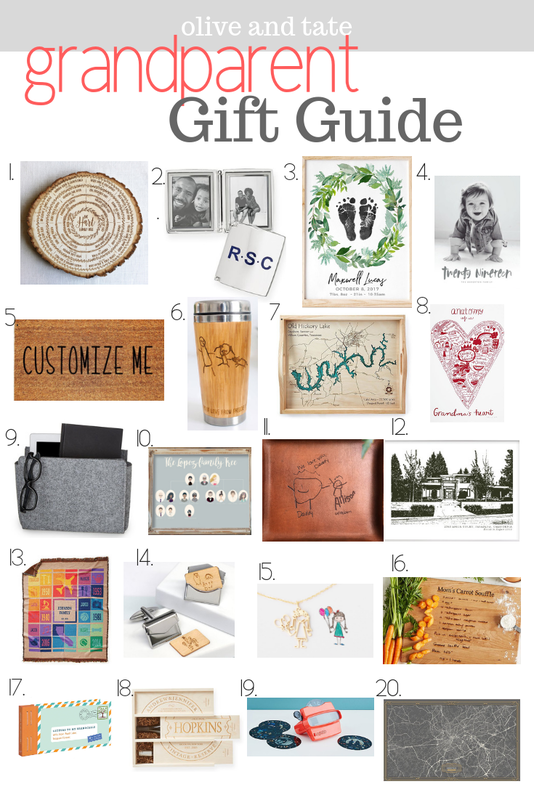 If you love this gift guide and plan to shop the post, please consider checking out in a web browser and not in an Instagram window or via an app. I do receive a small commission on purchases made via my links and unfortunately do not get credit for any sales made in an app (including the Amazon app on mobile) or via Instagram browser window. If a link from Olive and Tate is the last link you click before checking out, I will receive credit for your sale. Thank you so much for your continued support! Ok, so there's an item numbered 0 on this list because I forgot to include it and, because I think it's such a good idea, I couldn't let it go. When my parents were visiting recently, they fell in love with our Alexa and wanted one for themselves - I suggested they actually get an Amazon Echo Spot so that they could video call the kids without needing my phone or laptop. We're also going to upgrade to a Spot and will pop in on the kitchen counter so the kids can call their grandparents whenever they want - and I won't have to continually wipe baby boogers and such from my phone screen. Rumor has it (and my rumor, I mean the Amazon home page) that there will be a Black Friday deal for a pair of Spot's priced to move so I'll keep you updated via Insta stories if that goes down! First of all, I kinda can't believe that this custom family genealogy doesn't cost more than it does because I cannot imagine the work that goes into making this beauty. Your family tree will be hand burned into a wood slice harvested from a sustainable forest and are available in both mini and regular sizes. There are also two styles of family tree layout to choose from and both are truly gorgeous - the detail in each one is truly amazing. P.S. There is also a Christmas ornament version! Ever heard of a Grandma's Brag Book? It's a little photo album that a grandmother carries around with her so that she's ready for every opportunity to whip out pics of her grand-babies to brag about them. Consider this monogrammed metal pocket frame to be the sleeker version of a brag book, with room for two photos and available in a ton of finishes, it is perfect for a purse or console of Grandpa's car. We gave my parents something similar for Gray's first Christmas and it was a hit - we used a scanner app on our phone to turn those tiny newborn footprints into an amazing keepsake they could hang in their home. This particular version can be customized a million different ways to include all of baby's vital stats, name and even a color scheme to match Grandma's decor. Ok, so this is a bit of a cliche grandparent gift but I had to include it because this version of a yearly wall calendar not only lets your customize photos, fonts and style but it also allows you to add up to 10 special dates on the calendar for free. Think how sweet it would be to add in special birthdays, events at school (like Grandparent's Day!) or special trips you have planned together. I love the idea of a custom door mat made just for grandparents that says "Welcome to Grandma's House!" or "My Grandma and Granddad Live Here!" - ask your kiddo for suggestions and I bet you'll come up with an adorable gift. One of my fave grandparent finds this year, I love this travel mug that is engraved with a child's art or handwriting as well as a message. The wood exterior is bamboo and the interior of the travel cup is stainless steel, making it perfect for that morning commute or road trip to see the grandbabies. I chose this custom waterway serving tray with my family in mind, as we grew up on the water. This tray (also available in a print) is a topological map of a body of water or estuary of your choice laser cut onto a wood serving tray. The art itself is covered in glass making the tray useful and gorgeous. The site will walk you through finding your chosen body of water (or island) and the maps are truly something special. For the sentimental Grandma who loves quirky art, this little print has it covered. It also comes in a mug option and would be perfect framed and hung next to a special photo of Grandma and her littles. Perfect for stashing those glasses, books, remotes and laptops, this little pocket hangs on a bed frame to keep all of the essentials near. Honestly, I think I'm adding this to my own wish list! I love the less than traditional style of this custom family tree print - each person can be customized to match their personality, style or personality - seriously zoom in on some of the previously created family artwork and you'll be sure you're about to hit the gifting out of the park. Another perfect spot for those pre-school masterpieces, this leather catch all tray is perfect for any grandparent, but I love the masculine edge specifically for Grandpa. If your babe is too little for artwork, there's an option to add a teeny tiny footprint here. I think I include an homage to homes in every single gift guide that I create, so it's no surprise that I've added this black and white custom house art print to the Grandparent round up. I think our homes represent so many memories and the homes we grew up - or raised our babies in - are worth memorializing. This piece can range in size from 7"x5" to 20"x16" and can be framed in house to save you major time! This blanket has a funky style with deep meaning - each block of the blanket design is customized to match the person. Add a name then birth year, hobbies, interests, important milestones and build out the rest of the family tree from there. I'm all about the custom art when it comes to the grandparents (what else should we be doing with all of those pre-school creations!?) and this cufflink set might be the most unique use yet - each silver envelope cufflink holds a tiny wooden square that can be etched with artwork, handwriting or a message. The silver envelopes open and close, letting you access the special pieces inside whenever you need a reminder of those sweet grandbabies. And if Grandpas gets special cufflinks, then Grandma gets a special necklace! Each of these gold necklaces is created from baby art, Grandma can match Grandpa or have her very own drawing to wear around her neck. Does Grandpa have a special recipe or is there a traditional recipe that means something special to your family? Each of these cherry wood cutting boards has your recipe etched with the chef's handwriting. I love this little book (and so does Oprah!). Each set includes 12 letter writing prompts to encourage Grandparents to document some of their best memories, lessons and wisdom - which are then sealed and postdated for the future. It's essentially a Grandparent written time capsule, a perfect gift for everyone involved. Fill this box with three bottles of wine of important vintage to the grandparents - maybe the years of their grandchildren's birth or the year they were married and then two significant wedding anniversaries, or even the years of major trips to remember - no matter what dates you choose this wine box is special. Each box is hand etched with the names and "established" date of the recipient. I will say this gift was marketed for newlyweds but I think I love it for Grandparents even more. So, I love this quirky little idea for the Grandparents who have it all - the old fashioned view finder toy is customized with your photos on the film wheel. Imagine filling your slides with photos from a family trip or special photos of the grandparents meeting their newest loves for the first time. It's unique and special, perfect for grandparents with a sense of humor! Choose a special place to the grandparents and have this gorgeous print made up to hang on their walls. The city where they were married, grew their family, a favorite travel destination - the options are endless. Hi! I love ALL these ideas! I am trying to click on the black-and-white house print but it is taking me to the footprint art instead. I will check back later to see if it's fixed - I think this would be perfect for my in-laws. Thank you for putting this together!